A rather sardonic—yet thoughtful—recent post on the online news site Mashable traces the history of the term “thought leader.” It begins by citing Wikipedia, which claims that it was the editor of a publication from the consulting firm Booz Allen Hamilton Inc. who first coined the term in a 1994 article in which some notably influential people were quoted. Personally, I don’t think “thought leader” should be anointed or claimed. It’s about earning your chops by moving critical conversations forward. For decades, in fact for more than a hundred years, ASME has earned those chops by convening people who move engineering and technology conversations forward through technical committee meetings, publications, and conferences, and by breakthrough work in the standards and certification arena. Last month, the Society began a new series—more of a movement actually—called ASME Decision Point Dialogues designed to challenge leaders from industry, government, academia, and NGOs to grapple with a series of complex questions facing engineers and technologists. The aim is to raise awareness of existing conflict points and stimulate the kind of debate that leads to bold decisions and disruptive learning. This movement started with a unique conversation—videotaped in April and accessible now on ASME.org—among leading subject matter experts who tackle the question of how to prepare and inspire generations of engineers to solve the most pressing global challenges. 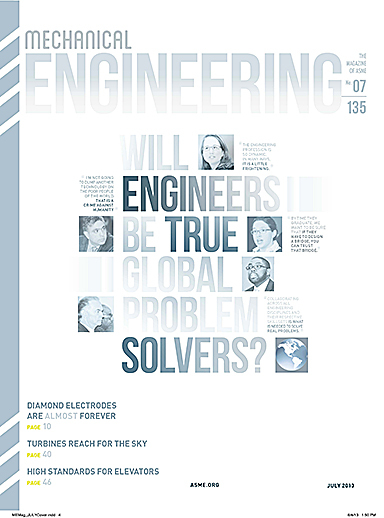 As you’ll see, they’re steered by a Columbia Law School professor who leads the discussion around the question: Will engineers be true global problem solvers? (This month’s cover story on page 32, written by associate editor Alan Brown, looks at the scenario that was the basis of the first dialogue.) The vision for the initiative includes virtual and face-to-face events, so stay tuned. In the meantime, the online dialogue begins now with your participation. Visit the Dialogues page at go.asme.org/dialogues. ASME’s Decision Point Dialogues live event was modeled after the Fred Friendly Seminars, a series of dialogues and public television programs that explored complex, vital issues using the Socratic dialogue format. Friendly was president of CBS News back in the days of the legendary journalist Edward R. Murrow. You may be most familiar with Friendly through George Clooney, who played the role of Friendly in the 2005 film, Good Night, and Good Luck. From behind the camera, Friendly was an authoritative figure who influenced the nation’s perspective during challenging times. He was a thought leader. Clooney is the leading man who brought Friendly in front of the camera for everyone to notice. pokst was great. I do not know who you are but definitely you are going to a famous blogger if you are not already 😉 Cheers! opinion, if all webmasters and bloggers made good content as you probably did, the net shall be a lot more helpful than ever before. their advertisement in apps thus they make their branding. So we see a number of important guidelines or recommendations included in this article to help Android application developer in their Android application development task so as to create optimized applications. However, taking a few precautions before you leave could potentially save you a bundle. the Google Nexus 4 has a 2,100 m – Ah battery good for up to 15.
good Download Mobdro program that is free. You should test your PC is not unavailable not or yo install this program.nice. good You can select the various performers, you can select any type of music and video clips from any part of the globe. You can stream and download video clips and music	nice. good This greatest water softener comes with a Water Crystal Display on the back-light indication, which is usually present along with the controller offered on it. nice. awesome TV Player for iphone does not come free, however it deserves it thinking about the attributes the video clip gamer supplies to its individuals. good To see live TELEVISION channels, online streaming, HD video clips, movies on your iPhone, iPad, iphone	nice. good It likewise flies by in a worried blur and also you’ll likely not keep in mind a lot about it, so these images are two times as important agreat deal nice.